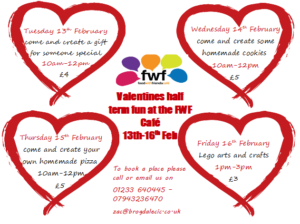 The Food with Friends Ashford will be having fun around Valentines Day with a number of activities. All the activities can be seen below. Tuesday 13th February make a gift for someone special. Wednesday 14th will be Valentines Day cookies to share with your loved ones and family. Thursday 15th will see the FWF team making pizzas and on Friday they will have a lego and crafts session in the afternoon.